On 7th Of September in Estonian city Piltsama 35. V. Alliperes grand prix was taking part. 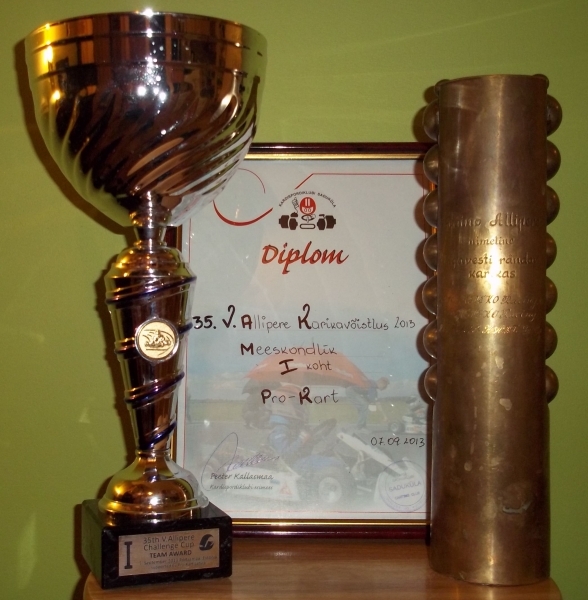 As in year 2012 PRO KART team was taking the first place it was important to keep the cup. Nothing to hide, the cup stay’s at PRO KART garage also in this year. This grand prix is taking place 35 years in honor of Vaino Alliperi who was the first Estonian to gain PSRS champion title in go karts. For so long lifetime of this grand prix many thanks goes to Peeter Kallasmaa, who was go kart driver himself as well as functionary of go kart commission and mechanic and trainer to his san, and currently his grandson is taking part in competition organized by him. Alliperes cup is wined in team competition. This year PRO KART team was represented by Andrejs Gubarevs (MiniMax), Nauris Danebergs (MicroMax), Dairis Vīksne, Rihards Pavlovs and Kristaps Dambis (all Open125), Juris Zālītis (DD2), Kristaps Gasparovičs, Mārtiņš Lapiņš and Valdis Brutāns jr. (all KZ2). In individual competition in top three places was Andrejs Gubarevs, Juris Zālītis, Kristaps Gasparovičs and Mārtiņš Lapiņš, these pilots were the main characters in this bright victory. Next year there will be some changes in rules of Alliperes competition. In every team there must be some CZ or Sojuz class representative. These changes does not limit PRO KART team possibilities to keep the cup also third time as also in these classes we have the best drivers. Also after a year PRO KART will be on the grid. My name is Aly and I would like to know if you would have any interest to have your website here at prokart.lv promoted as a resource on our blog alychidesign.com ? Thanks for sharing. Your post is a useful couibtrntion.